Through the ups and downs of real estate, one technique has held strong and has made millionaires out of scores of investors. An investor buys a property at a low price in an area poised for growth. They hold the property long-term and allow their tenants to pay for all the monthly expenses while paying down the mortgage. At the same time the investor enjoys the equity growth and increasing rental returns from the property. Building Wealth is not meant to be complicated! Keep it simple and reap the rewards of a successful real estate investor. 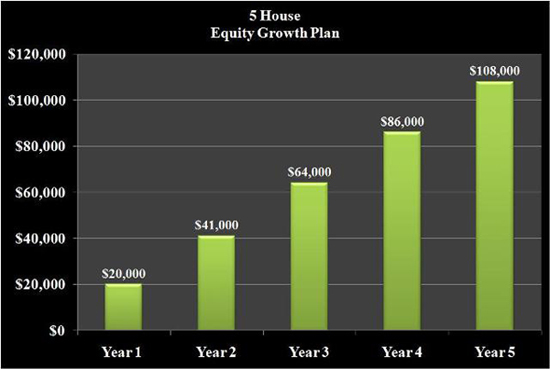 **Imagine if you were to buy 5 houses the over the next 5 years. 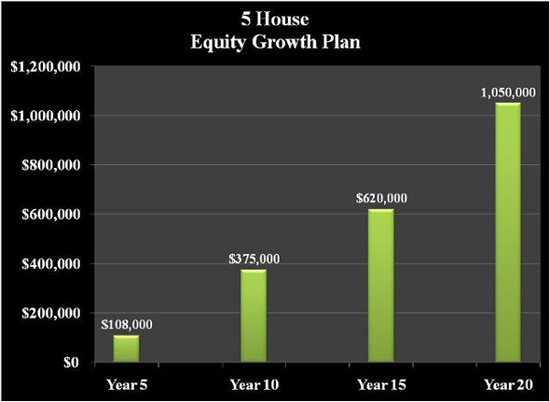 In 15 years you could have over $600,000 in equity! Possibly more with the help of a mortgage acceleration program. Talk to us today about igniting your real estate investments and paying off your property in as little as 7 years. sample deal, over a 5 year period, is 375%.